3M™ is a science based company producing thousands of products including a comprehensive range of packaging tapes. The range includes consistent and reliable 3M™ adhesive tapes including polypropylene and vinyl packaging tapes and machine length tapes. There is a range of 3M™ asking tapes with varying technical properties and double sided tapes which can be used on a wide range of surfaces. In the industrial area there are 3M™ cross- weave glass filament tapes for reinforcing cartons and containers and also a handy kit which includes a dispenser. 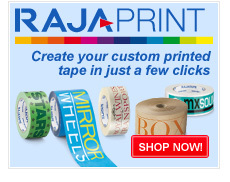 And don’t forget to check out 3M adhesive transfer tapes, kits and dispensers. Anything else you need to know about 3M™ tape? Ask one of our packaging specialists on 0800 542 44 28.